Kate Moss is an English supermodel and is considered to be one of the world’s top 100 most influential people. She has many controversies and successes. 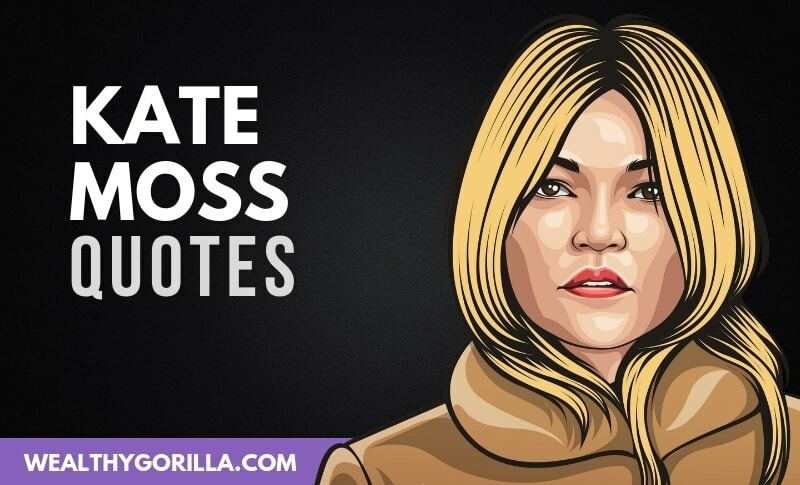 Thanks for viewing this collection of the best Kate Moss quotes! Don’t forget to use the buttons below to share these quotes with your friends. Do you have a favorite Kate Moss quote? Leave a comment below. Emmy Wallin is a writer for Wealthy Gorilla. She is a young Swedish girl from Uppsala, who is currently traveling around the world. Emmy has a big passion for helping others and motivating people. Wealthy Gorilla is one of the fastest growing self-development websites worldwide; with articles and stories covering everything from quotes, net worths, richest lists, self-development lessons, and more. We have reached over 40 million views in the past 5 years, and amassed over 200,000 followers on social media. We are continuing on our mission to inspire and motivate people around the world. Welcome to our community, and we are so grateful to have you here with us. You can click on any of the buttons below to follow us on our social media channels; or to get in touch with the founder, Dan Western, head over to the 'contact' page.